Badruddin Qazi. Also known as, in fact better known as, Johnny Walker. He strode the screen like a colossus, almost on par with the leading stars of the films he acted in. It is not something that he imagined would happen; in fact, while he was besotted with films and spent every free moment trying to hustle up some work, he was employed as a bus conductor. His love for entertaining people was evident even while working his day-job. He cracked jokes for his passengers, making them laugh on the way to work and back. It was on one such journey that Balraj Sahni made his acquaintance. Sahni was then scripting Baazi for Guru Dutt, and was amused by Qazi's antics. So much so, he took the man to meet Guru Dutt. So goes one version. The other version, in an interview with Johnny Walker (and that's not to say that it is true) was that he was playing the fool on the sets of Hulchul, where one of his friends had managed to get him a bit role, and Balraj Sahni walked in. He was amused by what he saw, and ordered Qazi off to Guru Dutt's sets since the latter was at the casting stage. Qazi walked in, pretending to be drunk, and so impressed Guru Dutt, that he signed him on the spot. (You pays your money, and you takes your choice.) Be that as it may, it is clear that Balraj Sahni had a great role in shaping the career of a man called Johnny Walker, who ruled over comedy in Hindi films for close to two decades. It was Guru Dutt who named him Johnny Walker for the screen. (It's ironical considering Johnny Walker is a teetotaller.) 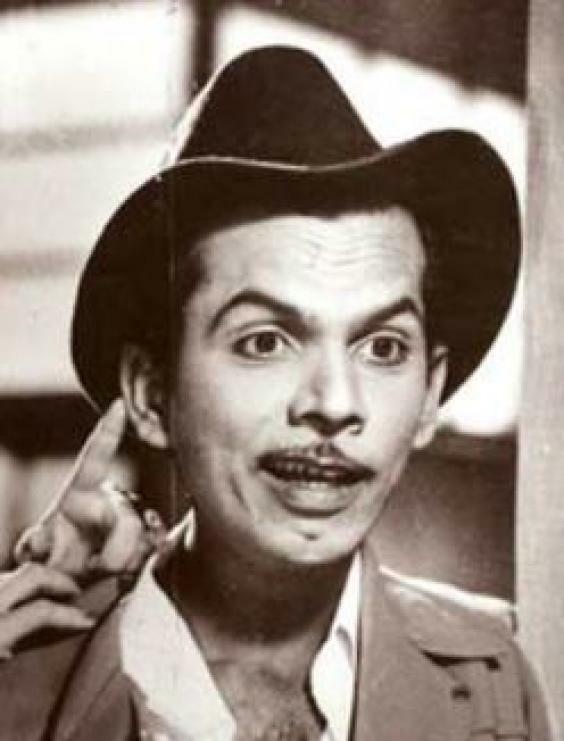 From then on, Johnny Walker was a fixture in Guru Dutt Films. His friendship with Guru Dutt continued until the latter's death. Guru Dutt often rewrote his scripts to include a role for Johnny Walker and the latter’s scenes in Dutt's films were almost always impromptu - Guru Dutt would give him the scene and dialogue and tell him "See if you can do better." And every rehearsal would see a new dialogue. Dutt kept note of which version made his crew laugh the most, and that was the dialogue which would be retained. Johnny Walker had the inborn ability to come up with one-liners. He was perhaps the only comedian who had stories written keeping him in mind. And all he had to do was to appear before the camera for the chuckles to begin. In fact, his popularity was such that producers began to insist that a song be written for him. And since he insisted on Mohammed Rafi as his voice, we were presented with some wonderful melodies that could not have been sung by anyone else behind the scenes or on screen but the Rafi-Johnny Walker combination. And if it is so easy to figure out just when Rafi is singing for Shammi Kapoor, his songs for Johnny Walker were as unmistakeable. Rafisaab had Johnny Walker's nasal twang down pat. Johnny Walker had the unique ability to laugh at himself; when he left films voluntarily ("the comedy was becoming cheap and vulgar", he stated), he began a business in precious and semi-precious stones. It was so successful, he claimed in an interview, his partner died of happiness. Rishi Kapoor had the best epitaph for Johnny Walker - "Perhaps people in heaven were in dire need of laughs. Our loss is heavens' gain." Johnny Walker will always remain in the memories of people who love good cinema, good songs, and lots of laughter. So, today, on what would have been his 85th birthday, what better way to celebrate an artiste whose joie de vivre touched every cineaste than to take a look at some of the melodious songs that were picturised on this wonderful artiste and human being. This is more than just a Johnny Walker song. It's also a Bombay song. There has never been such a visual ode to the city before; Guru Dutt and OP Nayyar took us all on a merry tonga ride through Bombay’s streets, along with Kumkum and Johnny Walker. And while the visuals showcased the best of Bombay, the song itself mourned the heartlessness of the great city. But it was the Johnny Walker’s jaunty walk and inimitable grin that made the song what it eventually was on screen. An absolutely fantastic combination of music, lyrics and visuals – a dapper Johnny Walker romancing (soon-to-be-real-life-wife) Noor on reel; she demurs, he cajoles, mixing English with Hindi to come up with lines such as jigar se weak hoon main karo aisa na zulm, arre ho jaayenga fail abhi heart hamara tere sar ki kasam. And despite her averring that she does not want to fall in love (tauba tauba) he insists that somewhere *some* time, her heart must have gone pitter-pat at the thought of him, giving her sleepless nights. Of course not, she exclaims. But how can that be? He is shocked, shocked! If I were pushed to pick the favouritest of my favourite Johnny Walker songs, then this would be it. In a film that abounded with snappy comebacks (Tum socialist ho? Nahin, main cartoonist hoon. ), this was the cherry on top of the whipped cream. An office setting, with Johnny Walker looking for his jigar – under the table, amongst the files, inside a typewriter… while Yasmin, cute and dimpled, is not very sympathetic. Yahaan use laaye kaahe ko bina kaam re? (Why did you unnecessarily bring it here?) she asks. And so they go, back and forth, much to the amusement of their colleagues who come back to find both of them under the table. It’s a dark film, Pyaasa, and there isn’t much to alleviate the gloom except for Abdul Sattar and his champi. Johnny Walker’s Sattarbhai was the stray ray of sunshine that broke the unrelenting despair of the story’s arc. Not with a parallel comic sidetrack, but by being, by nature, a cheerful, happy-go-lucky man, who yet has the guts to stand by his friend when the chips are down. He takes the place of the ‘fool’, the man who is not afraid to dispense advice, unwelcome though it may be. Finally, though, he claims that all the world’s ills could be cured through – tel maalish. The song was visualised on a visit to Calcutta – Guru Dutt and Johnny Walker were having breakfast at a roadside stall when they noticed a roadside masseur plying his trade. Guru Dutt asked his companion to take note of the man’s characteristics. The song itself was a copy of a tune from Harry Black and the Tiger which Guru Dutt wanted to be copied note for note, much to Burmanda’s consternation. The maestro is said to have burst out ‘Public mujhe maarega!’ when he heard the demand, but Dutt was adamant. He later unbent enough to say that Burmanda could do what he wanted with the antaras, but the mukhda had to be copied 'one hundred per cent' from the original. And Burmanda had to be content. * Only, the wily music director arranged the tune such that it would be hard put to recognise the original at all. A peppy, frothy Salilda number in a film that already boasted of such wonderful melodies, this was burnished by Johnny Walker on screen as he stumbles through the village, drunk. His complaint? No one’s seen a peacock dance in the jungle, but all he has to do is drink ‘a little’ and everyone is aware of it! And then he sings about all the other things that people have NOT seen… to an interested audience of also-inebriated villagers. A Guru Dutt movie, though he didn’t live to see it complete; Johnny Walker is serenading the angry love of his life (I wonder whether Mohammed Rafi knew how many of his songs were used to tease women into falling in love with the men! ); he is on a bicycle, pedalling backwards even (of course!) as he tries to make his Bengali miss listen to his earnest pleas (also in a mixture of Hindi and English – he even spells out words, just in case), even threatening suicide if she doesn’t unbend. He is quite a cyclist, though, as he manages to keep pace with a tram through Calcutta’s crowded streets. She doesn't seem to be even close to forgiving him, though. Johnny Walker plays a well-known journalist who has come to the sleepy little town from Bombay to cover the story of the great challenge. And as he camps there, he entertains the local yokels who ask him who he is and where he’s come from – unlike the other songs that mix English with Hindi in the lyrics, here, he claims he will sing a Hindi song, English-style. His coverage of the unique race is picked up and published by many newspapers in many languages, increasing the interest in its outcome. Another bleak film, with a little relief in the form of a (woefully miscast but) suave Johnny Walker who is mourning that marriage means the end of freedom for a man; he is sure that it is definitely something that will be regretted soon after the deed’s done. To underline his point, he lists all the things that cannot be done after a man is leg-shackled. His companion (Meenu Mumtaz) is not amused. Neither is Rocky (Johnny Walker) when he realises that his musical musings haven't been heard by Mr Iyer! Johnny Walker is a cop who happens to be using his ‘job’ at Guru Dutt’s office as a cover while he keeps smugglers under observation. That, however, does not prevent him from trying to flirt with Waheeda Rehman when she comes to take up her new post as Dutt’s secretary. Or trying to stop Tun Tun from flirting when she comes in. When Waheeda is accused of her sister’s murder, it is Johnny Walker who deludes the sister’s nanny into believing he’s in love with her, serenading her in the garden until the besotted girl is neglecting her duties and telling him all she knows. One of Johnny Walker’s quintessential ‘drunken’ songs; Shammi in disguise, Johnny Walker foxed, and a beautiful Lillian. (Also look out for Edwina.) Johnny Walker plays a bumbling private detective in this crime-thriller-cat-and-mouse caper, with Shammi as his assistant. And it’s interesting to note that Johnny Walker can enunciate every word so clearly, while he is (as clearly) drunk. Hmm… (Even more interesting is the fact that Balraj Sahni plays the cop in charge of the case, and has a heroine of his own to woo! One of Johnny Walker’s (admittedly few) roles as leading man. Anita Guha was his heroine. The film wasn’t very successful but the songs were delightful. While the lyrics of this song were deeply philosophical, even sad, the picturisation was quietly amusing, even seguing into a dream sequence with hero and heroine on opposite sides of a deep chasm. It's funny to think that when I first heard this song way back when, I did not even think of it being picturised on Johnny Walker. It is not one of his 'usual' songs, is it? A totally forgettable film with a completely unforgettable musical score, Johnny Walker had not one, but two songs picturised on him – this one, and the more philosophical Ye duniya gol hai. His friend is getting married, and he would like to be married too – along with wishing his friend all the happiness in the world, he hopes that his friends will pray that he get married next. He even exhorts God to listen to his pleas and send him a bride. These are some of my favourites. What are yours? (Looking furtively around) Harvey, this song has a positive tropical fruit salad - pineapple, papaya, banana, tender coconut - and they even show the fruits! And it has Helen and Johnny Walker. Sigh. Dekhta chala gaya main: A drunk Johnny wooing a pretend-drunk Madhubala in Gateway of India. Munh se mat laga in a film that is also called Johnny Walker. More inebriated Johnny W, this time claiming that he is NOT drunk, and I believe him. He couldn't possibly sing so beautifully if he were drunk! Kisne chilman se maara from Baat Ek Raat Ki. For once, not only is he not drunk, he isn't even singing in Rafi's voice! Yaaron ki tamanna hai from Kahin Din Kahin Raat. I am so used to Rafi singing for Johnny Walker that it never even occurred to me that this song (sung by Mahendra Kapoor) was picturised on him. 10 favourite Johnny Walker songs? That is a difficult job! My favourite Johnn Walker song other than which you have already mentioned is in which Johnny doesn't move his lips at all! Madhu, you know, after I wrote this post, I remembered that one of your 'Ten Favourite' lists was a compilation of Johnny Walker songs. So, yesterday, before I published my list, I scooted over to ensure that I wasn't just duplicating it (and it wouldn't have surprised me at all if we had listed the same songs!). I was glad to see that we had enough differences! :) I think the more popular ones like those from CID, Mr & Mrs 55, etc., will be everyone's favourites, no? You had sent me the link to Beta dar mat on one of my other posts - that was the first time I was coming across that Johnny Walker song - it's so quintessentially Johnny Walker-ish, no? Favorite Johnny Walker songs? Are you kidding?! That is practically ALL his songs! I love the song from Gateway of - it's a movie that I haven't seen. Is Madhubala only pretend-tipsy? She's doing a good job of acting otherwise. I love Geeta Bali; but I must confess I didn't remember 'Aji Bas Shukriya' at all when I was compiling the songs. :( So, thank you for bringing that song back to memory! I spent my lunch hour listening to all the great songs you listed (and the ones in the Comments section). Johnny Walker was a class apart. Thanks for the lovely time. Lovely post, Anu. I love 'Ae dil hai mushkil jeena yahan'! As OP points out, it's difficult to NOT like a Johnny Walker song. I loved everything you have listed here, and the ones that were posted in the comments. There were quite a few that I hadn't heard before. I was at work and couldn't see all the songs properly! Ek pura gaana mere liye! Anda frutiy one at that. Tutti Frutti! You're welcome, Harvey. :) After all, you were so disappointed at the step-motherly treatment meted out to fruits that when I came across this, I at once thought of you! There are some songs in the comments section that I haven't heard before either, and some I didn't realise were picturised on Johnny Walker at all! I hadn't heard the song you mentioned until I was digging up my favourite songs on YouTube. It's hilarious. I had never even heard of the 'Maine kaha tha aana Sunday ko' song until you posted it! Nor had I heard a couple that have been posted in the comments - all in all, a good couple of hours went pleasantly by. :) Thanks, Anu. kaise diwali manaya lal from Paigham? These are not songs I recall, but I loved the picturisation of Kadki, tere hi naam clerki. Geeta Bali had such a flair for comedy, and she looks absolutely lovely here. And I envied the whistling too; I cannot whistle for toffee! I'm glad you enjoyed them, Ruhi. He really had some wonderful songs picturised on him. And he made them come alive on screen too. You're welcome, Harvey. :) Thank you for the kind words. You were so upset at the stepmotherly treatment accorded to fruits that when I came across this song, I immediately thought of you! Another "Seeta Aur Geeta" version, although I do not see either of you being the docile-gharelu Seeta (or was it Geeta) types. Is Kahani Mein Acksun, Emosun, Kumeddy or thoda trajaddi hai. Laughing out loud at that, Samir. No, somehow I don't think either Madhu or I would fit the gharelu stereotype. Nice post.Wonderful songs.Please check the year of his birth.It is 1923 according to wiki.Somehow I remember it to be 1922. Wow, I didn't even know one of them! All were new for me! Yes, Beta dar mat is very Johnny Walker. :-) But then, so are lots of the other songs you've listed! Noone's mentioned this one yet, I think. From Duniya, Tu hi meri Laxmi tu hi meri Chhaya - and of course one of the actresses he's singing it to onscreen is Laxmi Chhaya! Madhu, thanks for the mid-morning laugh! I hadn't come across this one *at all* - and it's hilarious! Thoroughly approve of your list. And a qwwali from Johny Walker is never a bad thing. Thanks, pacifist. The song from Preet Na Jaane Reet was on my radar, but I rejected it almost at the last minute because of its similarity to Jaane kahan mera jigar gaya ji. In this, he was searching for his dil. I haven't heard the other one (from Aakhri Dao) ; what a beautiful song. Thanks, pacifist for introducing me to such a trippy number! Another one that I haven't heard before! I'm glad I published this post - what a wonderful collection of songs in the comments section to add to my favourites! Thank you. Agree with your comment on the Changez Khan song - it isn't particularly good. I came across Mera miya bada be-imaan when I was looking up the links to the songs in my post; again, pleasant, but nothing really out of the ordinary (apart from Meenu Mumtaz).